This low-cost HDMI extender kit allows for the extension of HDMI signal up to 50 meters or 160 feet over single Cat5 or Cat6 Ethernet cable. This HDMI balun extender uses CAT-5 or CAT-6 cables as the media to extend the HDMI signal and IR remote control signal together for up to 160 ft (50 meters). It offers more flexibility and convenience in cable construction by using the Ethernet cable instead. This HDMI extender kit supports IR remote extension at the same time or used as a stand alone IR remote over Cat5/6 kit. No signal loss guaranteed and maintain the same sharp and crisp clear images running through Ethernet cables. Great alternative cabling solution for home entertainment center, computer labs, showrooms, boardrooms, training center, tradeshows and window displays and other commercial setups. The installation is very easy. 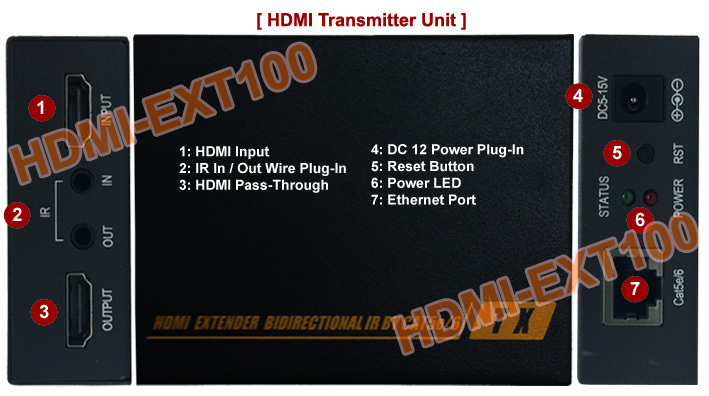 The HDMI transmitter unit should be connected to the HDMI video source such as HD cable box, Blu-ray DVD player, computer, etc. 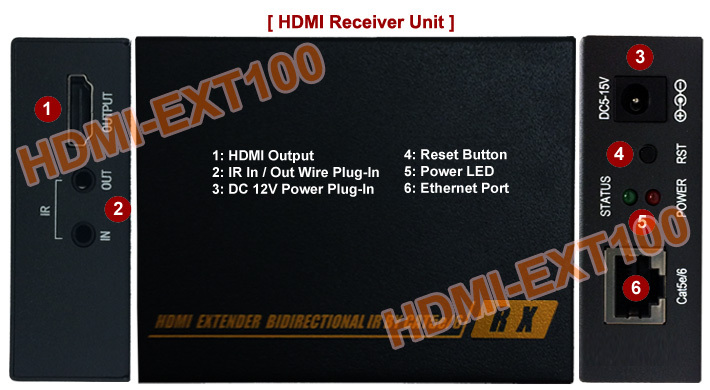 The paired HDMI receiver module should be placed at the remote location for connection with LCD TV, LCD projector, HDMI monitor, HD receiver and so on. At the end, the transmitter and receiver will be linked using standard Cat5e or Cat6 cable so the installation is all done. Both the transmitter and receiver units have active HDMI equalizer and booster circuitry built in to ensure error free signal transmission for the ultimate HD experience during the long cable run. With this extension device you can easily extend the HDMI signal for up to 160ft or 50 meters. 50m/160FT for 1080i, 720p, 1280x720, 1600x1200, etc. 40m/130FT for 480p, 800x600, 102x768, etc. 60m/200FT for 1080i, 720p, 1280x720, 1600x1200, etc. 70m/230FT for 480p, 800x600, 102x768, etc. This HDMI extender kit also supports IR remote extension at the same time or used as a stand alone IR remote over Cat5/6 Kit. Perfect solution for extending the IR remote control signals to greater distance using inexpensive CAT5/6 cable. Users can use the original devices' remote controllers to manage and control multiple IR-controlled devices at local or distant site regardless of the barriers. Solid IR remote control signal will be maintained all the way compared with unstable performance provided from those wireless type IR extender kits. Cat5/Cat6 cable offers a low-cost solution based on the broad availability of networking cable which is far more popular and flexible than regular HDMI cables, not to mention other facts that Cat5/Cat6 UTP cables being much lower at cost and easy to be customized for the length needed. In addition, CAT-5/CAT-6 Ethernet cables are easy to hide in a house and behind walls for ultimate flexibility. All-time professional choice for A/V installers. This HDMI over cat5/cat6 extender kit is also backward compatible with all DVI-D devices and displays too. Users can simply combine DVI to HDMI adapter/cable with this HDMI extender kit for working with DVI computer, DVI video switcher, DVI splitters to act together as a single large video extension system. Low-cost solution by using the inexpensive CAT-5E/ CAT-6 network cable to replace the HDMI cable for longer distance transmission with no signal loss. CAT-5e/6 cable can substitute HDMI cable to increase overall HD signal transmission distances. Twisted pair network cabling provides added protection against outside interference. Backwards compatible with DVI-D digital RGB signals. Supports IR remote extension at the same time or used as a stand alone IR remote over Cat5/6 kit. 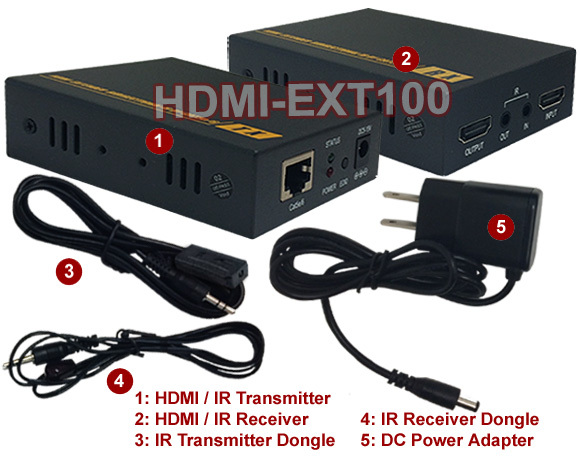 Combine the IR remote control signal with HDMI signal into one cable run. Accurate and reliable reproduction of the IR remote signal, with no signal attenuation or distortion. Active HDMI equalizer and booster circuitry built in to ensure error free signal transmission during the long cable run. Auto adjustment of feedback, equalization and amplification for all cable length. Supports HD devices at 480p, 576p, 720p, 1080i and 1080p resolution. Supports computer HDMI DVI RGB resolution from 640x480 to 1920x1200 pixels. Supports 12-bit per channel (36-bit all channel) deep color and 3D format. Supports HDMI 1.3, HDCP 1.2 and DVI 1.0. Supports uncompressed LPCM audio and compressed audio such as DTS, Dolby Digital, DTS-HD and Dolby True HD. Active drive and compensation for error-free transmission. No configuration required.